Maintain fresh environments and improve trash management efforts for indoor or outdoor facilities with 26 gallon trash receptacles. Classic rounded edges style design featuring a large trash opening that maximizes convenience—the funnel lid is made of aluminum that tightly fits to the base, concealing contents while allowing for hygienic hands-free litter disposal. 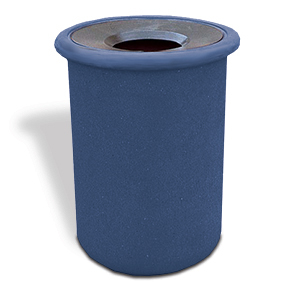 Made of sturdy plastic the 26 gallon waste container base simply wipes clean with soap and water—and will not stain, rust, dent or chip from high volume day to day use. These tough trash receptacles exceed when tested and rated for long term weatherability (UV8) and environmental stress and crack resistance (ESCR).